The international professional group representing organ transplant specialists has written an open letter to Xi Jinping, urging him to take personal action against ongoing corruption in the organ transplant system in China. A group of eminent surgeons belonging to the Transplantation Society have written a strongly-worded letter to the Chinese president, saying the latest government moves to overhaul China organ transplant system are not working, with some Chinese hospitals continuing to openly advertise the sale of organs from executed prisoners to private buyers. Dr Francis Delmonico and seven colleagues say Chinese transplant surgeons have been the subject of a long-running embargo in international academic circles because of their country's practice of selling organs taken from executed prisoners. The Transplantation Society says it welcomed China's latest moves to ban these unethical practices, and the implementation of a new ethical system of organ donation and transplantation based on clinical need. However, the group says the new system is already looking to be a sham and the rules against organ trading a "paper tiger" because of ongoing commercial trading or organs by some Chinese hospitals. Their letter cites the example of a liver transplant for a Saudi teenage girl recently done for a price of $200,000 by a Tianjin hospital. The transplant turned out to be wholly unsuitable because the liver was scarred and diseased and the girl died. 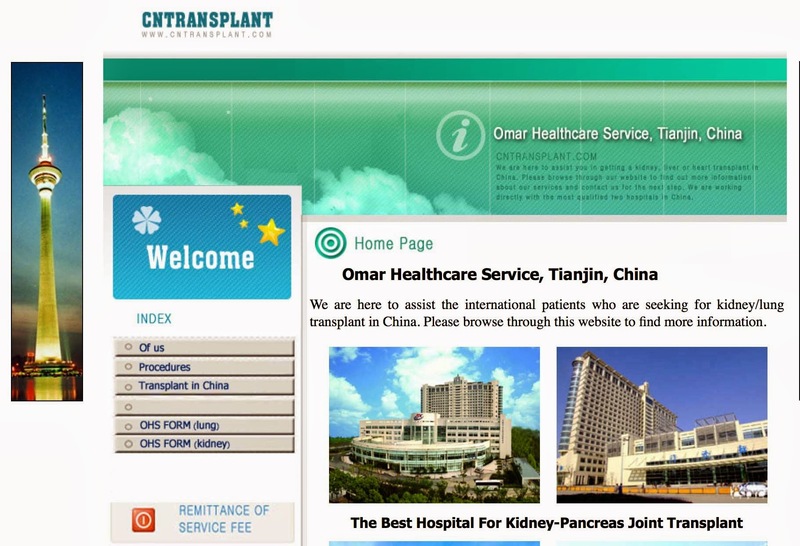 The transplant was illegal unethical and should never have been done, but the Tianjin hospital that did it is still advertising organs for international buyers at www.cntransplant.com. The Transplantation Society doctors say this is just one example of how unaccountable and corrupt the organ transplantation system continues to be in China. They also note that many of the Chinese doctors and officials involved in corrupt organ trading in the old system have already taken up positions of responsibility in the new system. "These centers are both jeopardizing the public trust at home and tarnishing China’s reputation on the international stage," they write. "Thus, we ask the Chinese government for an immediate and sustained resolve, to monitor compliance by Chinese professionals in performing organ donation and transplantation in accordance with NHFPC and international standards. The fledgling national organ allocation computer system that has been developed must be authorized as the sole distributor of organs to ensure transparency and fairness. Otherwise, the perception will be that one corrupt system of organ donation in China has simply been replaced by another," they conclude.